Lots 1377-1402 U.S. Postal History - Packets/Inland Waterways, Railroads, Misc. Lots 1477-1548 William Spicer Collection - Mail From China To the U.S.
Lots 1641-1693 William Spicer Collection - Spanish-American War, Siberia, Misc. 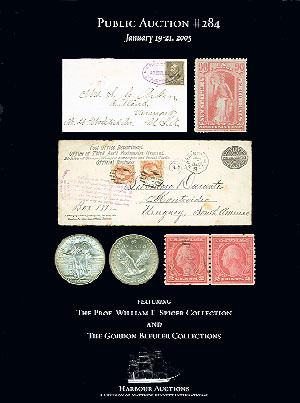 Lots 1836-1862 Gordon Bleuler Collection - Advertising Covers & Misc. Lots 1984-2013 Gordon Bleuler Collection - Hawaii U.S Used in Hawaii, Advertising, Misc. Lots 2111-2163 General Foreign - Cayman Islands through F.S.A.T. Lots 2480-2514 Zeppelin Covers - Great Britain through U.S.